Defense officials found elevated levels of chemicals used in firefighting foam in the drinking water at 11 U.S. military installations, government auditors reported, leading to the shuttering of some water sources and the installation of treatment systems in others. The chemicals are needed so the foam meets military requirements for how fast it puts out fires and how long it prevents them from flaming back up. But the Environmental Protection Agency has issued health advisories about exposure to some of the foam’s ingredients, according to a Government Accountability Office report. A well at Camp Pendleton, California, found to contain the chemicals was taken out of service, and the affected reservoir was drained and refilled with water from another source, the report states. A company that operates drinking water systems at Fort Leavenworth, Kansas, shuttered two wells that contain the chemicals and plans to install a treatment system before bringing those wells back into service. GAO auditors interviewed service and installation officials about the current and future use of the firefighting foam, and reviewed Defense Department data on testing and cleanup efforts. They also visited seven installations. The chemicals in question are part of firefighting foam that’s used by DoD and civilian airports: perfluorooctane sulfonate, or PFOS, and perfluorooctanoic acid, or PFOA. They’re part of a larger group of manufactured compounds called perfluorinated chemicals, better known as PFCs. GAO wants DoD to look into its water-treatment facilities. The military services have directed installations to test for PFOS and PFOA in their drinking water and take steps to address water that contains amounts of PFOS and PFOA above the EPA’s lifetime health advisory level. The Navy and Air Force have completed their testing, according to the report, and the Army was expected to complete their testing at the end of September. Alaska: Eielson Air Force Base. California: Camp Pendleton (South), Fort Hunter Liggett and Naval Support Activity Monterey (radio transmitter facility). Idaho: Mountain Home Air Force Base. New Hampshire: New Boston Air Force Station. Ohio: Wright-Patterson Air Force Base. Pennsylvania: Horsham Air Guard Station. Virginia: Naval Auxiliary Landing Field Fentress. DoD has also taken steps to address elevated levels of these chemicals in the drinking water in communities outside 19 military installations, based on their testing. That includes installing treatment systems or supplying bottled water. The military services have also issued policies restricting the use of existing foams that contain PFCs. For example, Air Force policy stops routine testing of firefighting equipment unless the released foam can be contained and managed. All releases of firefighting foam with PFOS or PFOA must treated as hazardous material releases. Army policy prohibits all nonemergency discharges of firefighting foam, to include training and equipment testing. The Navy has stopped the uncontrolled release of firefighting foam except in emergency situations. 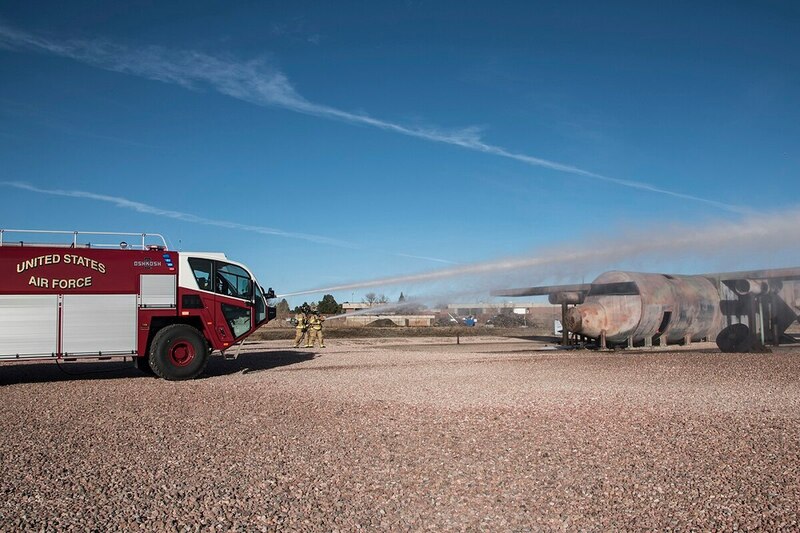 DoD intends to eventually replace the firefighting foam that contains PFOS and PFOA, and is funding research to develop PFC-free firefighting foam, the auditors reported.